1 of 3 Bring a large pot of lightly salted water to boiling. Add elbow macaroni and cook 7 minutes, or as per package directions; drain and transfer to a large bowl. 2 of 3 Meanwhile, in a large saucepan, heat oil on medium-low heat. Add chorizo and cook 5 minutes. Increase heat to medium-high and add pepper; saute for 3 minutes. Stir in garlic and cook another 1 to 2 minutes. 3 of 3 Add butter to saucepan; when melted, sprinkle in flour, whisking constantly for 2 minutes. Pour in milk, whisking until the liquid comes to a boil. Simmer until thickened, about 3 minutes. Remove from heat and stir in cheese. Mix until smooth. 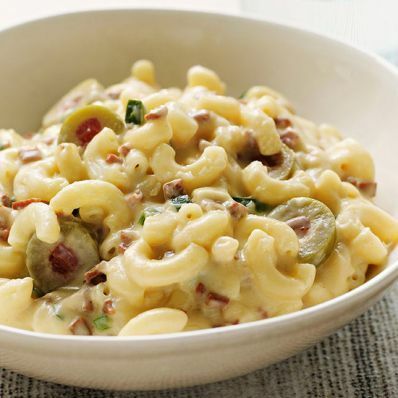 Stir into cooked macaroni with olives.